UPDATE: Over 450 children participated in the clinics and approximately 200 parents attended the football safety educational meeting. View photos from the Davie and North Davidson Heads Up youth football clinics. 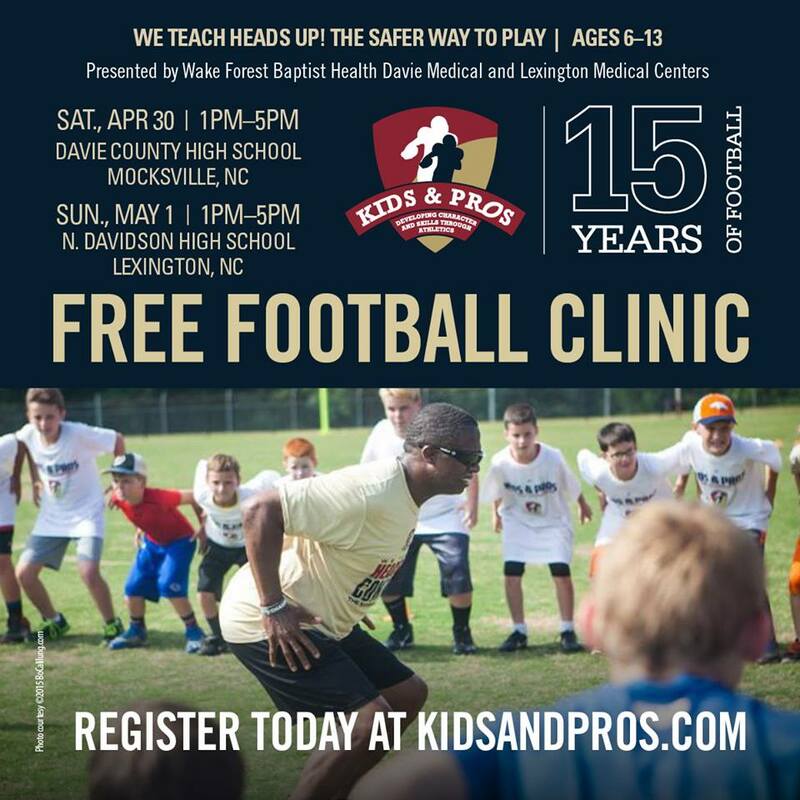 WINSTON-SALEM, N.C. – Youth football players will be able to learn safe blocking and tackling techniques, position fundamentals and life skills from former NFL players at two Kids & Pros clinics sponsored by Wake Forest Baptist Health’s Davie Medical Center and Lexington Medical Center. These free, non-contact clinics are open to players ages 6 to 13. They will be held on Saturday, April 30, at Davie County High School in Mocksville and on Sunday, May 1, at North Davidson High School in Lexington. Both will run from 1 to 5 p.m. Kids & Pros, a nonprofit organization founded in 2002 by former Atlanta Falcons player Buddy Curry, conducts youth camps and clinics throughout the Southeast that incorporate USA Football’s Heads Up Football player-safety program. The Mocksville and Lexington clinics also will include hour-long information sessions for parents and coaches on football safety, concussion awareness and related topics. These sessions will begin at 2:30 p.m. at each clinic. The Kids & Pros clinics are free but space is limited and online registration by a parent or legal guardian is required. To register for the April 30 clinic at Davie County High, go to: www.kidsandpros.com/2016/02/08/2016-clinics-nc-davie-county-april-30-2016/. To register for the May 1 clinic at North Davidson High, go to: www.kidsandpros.com/2016/02/12/2016-clinics-lexington-nc-may-1-2016/. To see results from last year’s events, click here. Media contacts: Mac Ingraham, mingraha@wakehealth.edu, 336-716-3487; Joe McCloskey, jmcclosk@wakehealth.edu; 336-716-1273..
Wake Forest Baptist Medical Center (www.wakehealth.edu) is a nationally recognized academic medical center in Winston-Salem, North Carolina, with an integrated enterprise including educational and research facilities, hospitals, clinics, diagnostic centers and other primary and specialty care facilities serving 24 counties in northwest North Carolina and southwest Virginia. Its divisions are Wake Forest Baptist Health, a regional clinical system that includes Brenner Children’s Hospital, Davie Medical Center and Lexington Medical Center and has close to 175 locations, 900 physicians and 1,000 acute care beds; Wake Forest School of Medicine, an established leader in medical education and research; and Wake Forest Innovations, which accelerates the commercialization of research discoveries and specialized research capabilities of Wake Forest Baptist Medical Center and operates Wake Forest Innovation Quarter, an urban district for research, business and education. Wake Forest Baptist clinical, research and educational programs are annually ranked among the best in the country by U.S. News & World Report. If you do not wish to receive news communications from Wake Forest Baptist Medical Center via email, or would prefer that they be sent to a different address, please indicate your preference by responding to this message.